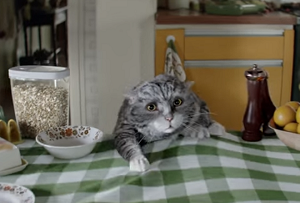 The grocer's Christmas cat advert seems to have done the trick. There’s no doubt that Sainsbury’s, like most other grocers, has big problems to contend with. New low-price competitors and a general fall in the price of food, along with the ever-changing habits of fickle customers, have made it exceptionally hard for a big supermarket to make any money this year. But as the nation’s consumers gear up to do their annual Christmas food shop, Mike Coupe’s lot look to be a nose ahead. According to figures from Kantar Worldpanel, Sainsbury’s sales in the 12 weeks to December 6 (a period that includes ‘Black Friday’) were up 1.2% - not exactly runaway growth, but a decent performance considering how dire things are looking for everybody else. All of Sainsbury’s big key rivals are still in decline – Morrisons by 2% and Tesco and Asda by 3.4% each. Ouch. Sales aren’t everything of course. All of the big supermarkets have had to slash prices to get customers through the doors, which isn’t going to be good for the bottom line. Sainsbury’s is also the only one of the ‘Big Four’with a higher market share than this time last year – up to 16.7% from 16.5%. There was a point in 2013 when Tesco’s market share hit 30.5%, but those days are long gone and it’s now down to 28%. It’s business as usual in the rest of the grocery market. Discounters Aldi and Lidl still account for 10% of all sales and their respective revenues are up 15.4% and 17.9% on last year, while sales at high-end Waitrose are up 2.4%. Iceland had better hope the nation’s Peter Andre fans splash out on its famous prawn rings this Christmas, after sales slumped 1.5%. We’ll have to wait until Sainsbury’s third quarter statement in January to see whether it had a merry Christmas, but for now it seems to be on the right track. The same cannot be said of its rivals.